“We’ve engaged with Nick for link building services when we’ve had bandwidth issues with our in-house team. It’s tough to find high quality providers and few make the cut. He and his team are professionals. Are you looking for Link Building Services that will deliver consistent high quality links? Do you want your awesome content seen by your target audience? Do you want highly targeted referral and organic traffic for you website? Do you need blogger outreach that results in links from real sites not link farms or PBN’s? If you’re looking for cheap SEO or generic Search Marketing Services then this is not for you. My typical clients include – mid to high value businesses producing amazing content that needs more visibility, PR and Marketing Agencies, or marketing departments looking to outsource audience development. 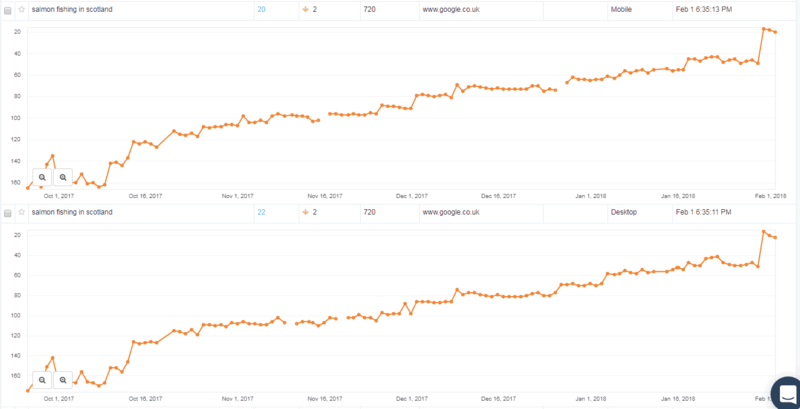 Scroll through the images and you will see various success stories of huge increases in organic traffic, serp rankings, and top 3 positions. How Much Do I Charge for my S ervices ? *Link building requires 2 types of content. Linkable assets that you create and publish on your own website and content for guest posts or sponsored posts that are published externally with a link back to your site. Please allow an additional budget for the creation of this content. I can advise on this and recommend resources. You should also budget for the cost of sponsored posts and blogger admin fees depending on the link types you are looking to acquire. Still here? Ok, let’s move on…. I’m now going to tell you what I will do for you if I take you as a client and how I do things. If, after all that, you want to hire me, then please give me a call or submit an enquiry using one of the many forms dotted about on this site. What will I do for you every month? When you become a client, I will personally work on your campaign identifying and contacting 100s relevant targets in a typical month (month 2 onwards). I usually achieve a 2 – 10% success rate in terms of securing links from the list of targets. This is very much dependent on your business sector and the type of links to be acquired. So, even at the entry level campaign, that’s up to 20 brand building, traffic generating, rank boosting, awesome links, every month! Month 1 is the set up phase and typically takes about 4 – 6 weeks. 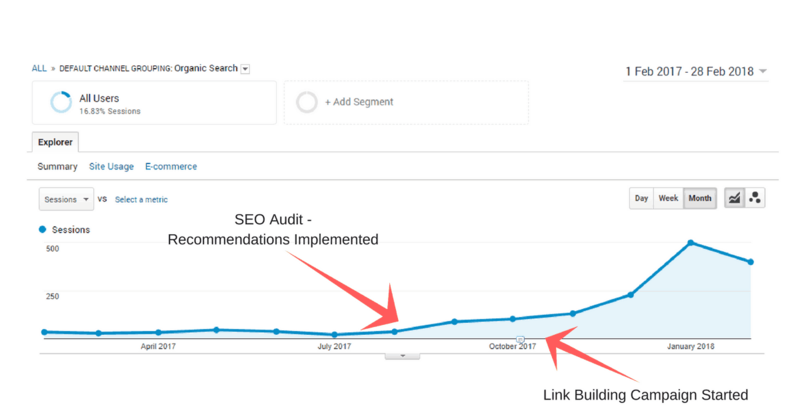 If required, I include my ultimate SEO and Content Audit to ensure you have everything in place to get the maximum results from your link building campaign. Once the foundations are in place I will start building your UBER links. As there is extra set up work in month 1, I will typically contact around 100 targets instead of 200. During this phase I will also create “pillow” links to diversify your link profile, if required. Important: There are so many shady SEO practices nowadays and so many variations of “SEO services” that it’s important to differentiate what I am offering here. These are the outdated tactics employed by the cheap or unscrupulous SEO companies that bombard you with emails and phone calls on a daily basis. These tactics can work …but the effect will be short term and will ultimately result in penalties from Google and lost rankings and traffic. What I am offering is sustainable, zero risk and very powerful. Access your Google analytics and Search Console to discover how your website visitors interact with your content, what keywords are sending traffic and what improvements can be made that will deliver the best results. Check anchor text ratio using industry standard tools such as Moz, Majestic and SEM Rush. If the anchor text is over optimised (too many anchors with the same keyword) I will look to dilute this with “easy” links using natural anchors such as your brand name, click here, website URL, etc. Is there anything already in place that can be used for link building (link worthy assets)? Is your content getting social media attention? Do you have someone that can create content on a regular basis? Are you willing to invest in on-going content creation? If you don’t have a resource for content I can recommend content creators. You should be budgeting for content to be used on-site and for outreach purposes. Audit your incoming links to check there is no spam,check the SEO metrics and see whether any of your content is already earning links. When I have completed the audit phase I will add the information gathered in the content audit to the project tracker. This is a google sheet that is updated in real time and as a client you will have access to this at all times. Using the keywords identified in the audit stage I create a huge list of special Google search strings. This allows me to return search results that only include the websites I want to target for acquiring the specific types links i want for my client. For example, if a client has a page on their yoga website that is an amazing resource for yoga teachers, I would search for websites with resource pages for yoga teachers using the search “yoga teacher inurl:resources”. This would return pages about yoga that have resource pages for yoga teachers that I would then contact to try and get them to link to my clients yoga teacher resource. As I’m sure you already know, there are numerous types of links that can be built from resource pages to guest posts and broken links to link reclamation. In this step I select the most appropriate link types to target based on the content I have to work with and the clients budget for creating more content. Using all the information gathered in the previous steps I am now able to create a project roadmap. A project management tab is added to the project spreadsheet detailing all the items to be completed with a column for the task status which is updated in real time as assigned, working or completed. This information is used to create a list of targets that will hopefully include a personal email address and contact name. With this information I then start prospecting. The information and the status of my outreach is recorded in the project spreadsheet which is available to you as a client at all times. I send personalised emails to each of the targets on the list using a specific email designed for the type of link I am trying to acquire. For example, the email I send for a content placement (guest post) will different to the email I send for a resource link. The aim here is to build a relationship with the prospect that not only leads to a link but perhaps also results in the target sharing the link with their social media networks for extra exposure. We all get swamped by emails on a daily basis and often miss important ones or forget about ones we want to act on. For this reason I have a 3 step follow up process that significantly increases the chances of a response from a link target and the acquisition of a link. Follow up messages are also adjusted depending on whether the prospect has opened the email and not replied or hasn’t opened the email at all ( I track all this). So that is the system I use to build your links. Increased organic traffic as a result of higher rankings due to Google rewarding your site for having relevant and authoritative sites linking to yours. This is very high quality traffic and is likely to convert better than any other traffic source because it is so targeted. This will depend on your budget, the content I have to work with and the type of links we are targeting. However, for my minimum fee, I will outreach to a maximum of 200 targets per month and I typically get a 3- 10% success rate in securing links. Hopefully you have all the information you need on how I work and what I charge. If so, please click the button to get in touch.